The District Attorney and reports on your criminal case. Charged with a crime or DUI? Think you are getting all the information on your case? Think again. The District Attorney or court will only provide a police report. There is more. A copy of the police dispatch may help you. There are calibration records for the breath or blood tests. Were instruments operating properly? There are records of repairs. Are there tape recordings or pictures? You won’t get them unless your attorney asks the right questions. 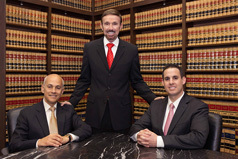 These are reasons why you need an experienced California criminal defense attorney. Call Wallin & Klarich.